Take a step back into the history of Cornucopia, established 1986 and Georgian Wicklow Street, Dublin. A 1920's toy shop, was one the original occupants of 20 Wicklow Street! 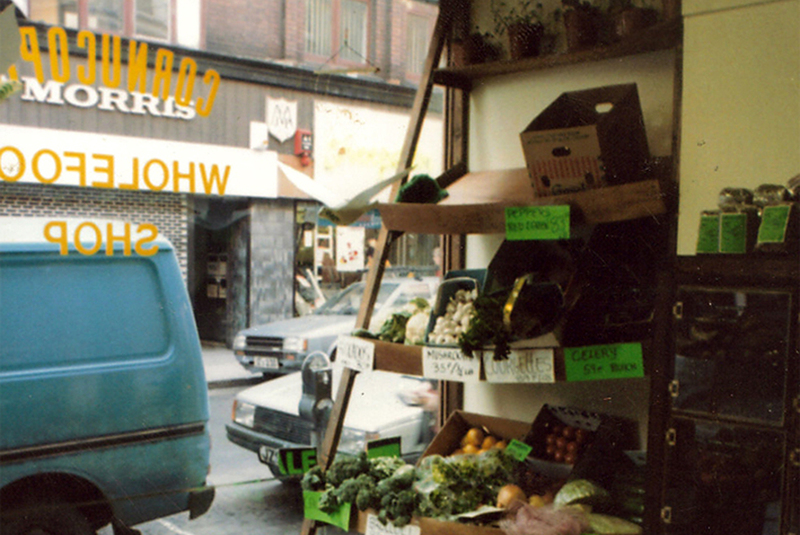 Cornucopia's doors were first opened on 19 Wicklow Street Dublin 2 by an enthusiastic young couple in 1986. Deirdre O’Mara, a Trinity sociology student from Whitehall, north Dublin met Neil McCafferty, a guitar-playing Derry man at a house party in 1976. They fell in love, and with their little savings set off to Boston, USA, where they lived out their 20's. Deirdre soon began volunteering in a health institution, which taught her the philosophy and benefits behind a whole food and plant-based diet. Both Deirdre and Neil worked there together and adopted a raw vegan diet which they found both healing and inspirational. Deirdre, with her warm friendly nature, and Neil with his passion for cooking, decided to return to Ireland with the dream to set up their own business. The late 1980's, during a difficult recession, was not the easiest time to have the courage for entrepreneurship. With help from Deirdre’s mum, Eileen, donating her freshly baked scones and the kindness of a customer Margaret volunteering, they took on the lease of 19 Wicklow Street, and opened Cornucopia health food shop and cafe in January 1986. Deirdre, with her warm friendly nature, and Neil with his passion for cooking, decided to return to Ireland with the dream to set up their own business. The late 1980s, during a difficult recession was not the easiest time to have the courage for entrepreneurship. But with help from Deirdre’s mum, Eileen, donating her freshly baked scones and the kindness of a customer called Margaret volunteering, they took on the lease of 19 Wicklow Street, and opened Cornucopia, health food shop and cafe in January 1986. Around the time that they had their two daughters Roisin and then Dairine, it had become obvious that Neil’s food was becoming more popular than the products on display. Many of the customers even resorted to unstocking the shelves just to have a place to put their bowl of hot soup and bread! 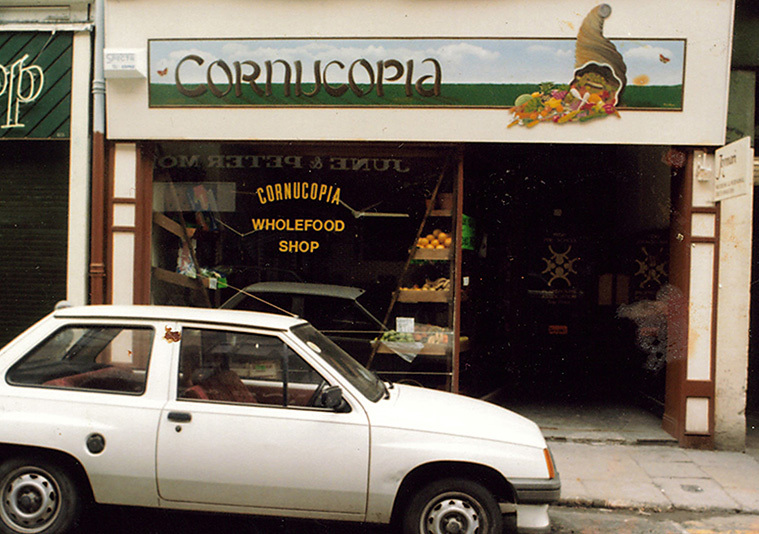 In 1993, they decided together to reopen Cornucopia entirely as a self service restaurant, serving an array of vegetarian main courses, salads, juices and cakes. In the same year, the family and business tragically lost Neil to a brief illness. Deirdre, with the support of her coworkers and friends bravely continued the business which continued to gain popularity. In 2007, produced by a team of chefs and waitresses in the restaurant, our first cookbook Cornucopia at Home was published. It won the inaugural award of Listowel Foodbook of the Year 2010, and has sold up to 18,000 copies to date. It was dedicated to Neil, and pays tribute to all the hard work of staff over the years. In the same year, the family and business tragically lost Neil to a brief illness. Deirdre, with the support of her coworkers and friends bravely continued the business which continued to gain popularity. In 2007, produced by a team of waitresses in the restaurant, our first cookbook Cornucopia at Home was published. It won the inaugural award of Listowel Foodbook of the Year 2010, and has sold up to 18,000 copies to date. It was dedicated to Neil, and pays tribute to all the hard work of staff over the years. In 2008, while the recession began to take hold of the Irish economy, Cornucopia extended the restaurant from no 19 into the beautiful Georgian building next door at no 20 Wicklow Street. It expanded from the original 48 seat restaurant, to 88 and shortly after extending again to the upstairs dining room to give us a total of 120 seats! Having these extra seats allowed Cornucopia to thrive, while things got back on track in the Irish economy. Cornucopia is a 100% family run business. Dairine, Deirdre's daughter has worked her way up through the ranks over the years, from working on the counter, to supervising, to job-sharing the role of General Manager and ultimately stepping into her mother's shoes as Director of the company. Her hard work, dedication, love of people and food make her a natural and capable successor to the family business. Cornucopia is a 100% family run business. Dairine, Deirdre's daughter has worked her way up through the ranks over the years, from working on the counter to supervising through to job-sharing the role of General Manager and ultimately stepping into her mother's shoes as Director of the company. Her hard work, dedication, love of people and food make her a natural and capable successor to the family business. In 2016 Cornucopia closed its doors for 8 long days and proudly re-opened with a beautiful new counter in place, improving queuing times and productivity and making the restaurant look beautiful at the same time.